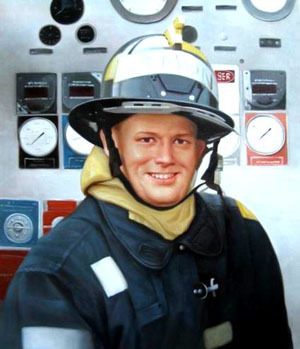 Sean Patrick Tallon, 26, was a reservist in the United States Marine Corps, a former emergency medical technician and a probationary firefighter with Ladder Company 10 just a few weeks away from the end of his training. He was tough, but he always wondered whether he measured up. "That's the way he was," said his older sister, Rosaleen DaRos. "He always thought everybody else was capable, but he was just as capable." Take the button accordion that Mr. Tallon loved to play. He would bring out his instrument and play Irish favorites for relatives at family gatherings, with his sister on the piano accordion. But he rarely played for friends; some of them didn't even know he could play an instrument. "He wanted to find Mrs. Right," Mrs. DaRos said. "That is what he said was his next mission. He said his probie year was almost finished and he wanted to start with the rest of his life. Everything was just all ready. He had just blossomed."